The Tri-Star™ XP module converts the rear turn signal lights to function as brake and turn signal lights and the XP will also add running lights to your signals. (Don't want running lights on your turn signals? Check out the original Tri-Star™) When the brakes are applied, the turn signal lights will also illuminate as brakes. If a turn signal is applied, it will have priority over the brake light function on the side that is selected. If the turn signal is canceled and the brakes are still applied, the brake light function of the turn signal lights illuminate steady on. 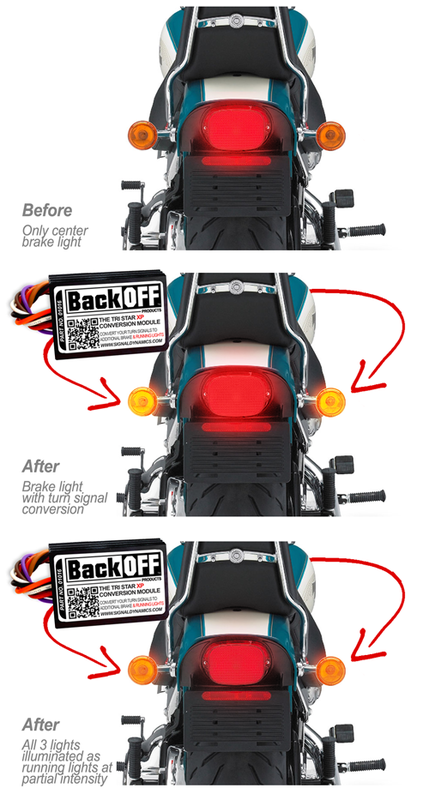 When your motorcycle is on, the turn signals will be illuminated at about 50% intensity to act as running lights at all times. Note: Tri-Star™ XP will not give your brake light any running light capabilities, it will only act as a running light converter for your rear turn signals only. To install, wire the Tri-Star™ XP Module as directed by the wiring color codes below. To begin, locate your left and right turn signal wires. Once located and tested, cut the left and right turn signal wires in two. Connect (crimp or solder) the violet wire with white trace to the cut end of the left turn signal wire leading to the actual light (back of motorcycle). Now connect the solid violet wire to the left turn signal wire leading toward the front of the motorcycle. Now, connect (crimp or solder) the brown wire with white trace to the cut end of the right turn signal wire leading to the actual light (back of motorcycle). Connect the solid brown wire to the right turn signal wire leading toward the front of the motorcycle. The orange wire from the Tri-Star™ XP will tap onto your running light wire. Connct the Black wire to a verified ground wire or source. Finally, tap the red wire with black trace onto your brake light wire. After installing a Tri-Star™ XP your turn signals may flash at a higher rate of speed, this is because your motorcycle is receiving a different load then before because the signal is now being rerouted through the Tri-Star™ XP module. We included the Dual Load Equalizer module to stablize the flash rate if this happens. (Install behind the Tri-Star™ XP Module, on wires leading to the front of the motorcycle.) If your turn signals are flashing quickly or not at all, install the Dual Load equalizer. Tap the violet wire to the left turn signal wire leading to the front of the motorcycle and then tap the brown wire to the right turn signal wire leading to the front of the motorcycle. To finish up, tap the black wire from the dual load equalizer on to a ground source. Mount the module(s) using the included double sided adhesive or any other suitable means. We recommend the module(s) not to be mounted in an area subject to extreme heat conditions or near high powered electrical areas such as your alternator. Note: Install behind the Tri-Star™ XP Module, on wires leading to the front of the motorcycle. What is the Dual Load Equalizer? I recently purchased the bike I've always wanted, pearl white 07 Honda cbr600rr, it has integrated tail light and custom turn signals down the pegs that were little dots, one set ran as yellow other dots in between went with brake and were red. I cut those off because I didn't like the dots I wanted nice standout white LED. After cutting out all this wire splicing this guy had done I kept trying combos to get my side peg white runners and back peg reds to match tail. I just knew there was a way but everyone kept telling me there want wasn't. I said all I need is a splitter ite converter that separates my sides, they said there was no such thing. Then somehow I came across this site and was so freaking excited!! Once I got my product it was easy to instal as I know the wiring well now after completely redoing it. The box is nice and small and fits in with wires no bulk. I love it and my friends who doubted me now say it looks damn good from behind! And fyi I'm a 33yr old lady who was in office jobs then medical field, no mechanic training or school but my father is a mechanic and my ex husband of 11yrs is a motorcycle mechanic we were together when he was going through school so I'd watch him and help once in a while but nothing big. So I have no formal training working on bikes I just figured things out and it came natural i guess, i also changed out the stock exhaust for a two brothers myself as well. But I would recommend these products 100% easy and effective and totally worth the money! always get good support, and the product works well. I have a pre-existing brake light unit from signal dynamics, it was on the bike when I bought it six years ago. went through two convertors from Harley Davidson in one year! s d equipment is a much better product for the same price as the factory junk. Quality product at a budget price! The Tri-Star™ XP Turn Signal To Brake Light and Running Light Conversion Module is a high quality piece of hardware at a value price. I installed my kit on a 13' XL1200C Sporty using aftermarket tail lights. The wiring instructions are simple because the installation is simple. I used the factory connectors on both ends to keep it simple and look as factory as possible. This allowed me to use the factory ground wires which eliminate the need to add more. I soldered all of my connections and used heat shrink tubing to protect the joints for a really clean installation. The lights perform as intended and are brighter than the factory ones were. I would highly recommend this kit to anyone in the market to convert their turn signals. Look no further because this product is the right choice when you demand quality and a fair price. This was easy to install and works great. I now have two more running lights and brake lights. I like ow it looks. Being visible is good!